I am excited to write a new post today. It is 2018, guys! Wohoooo. 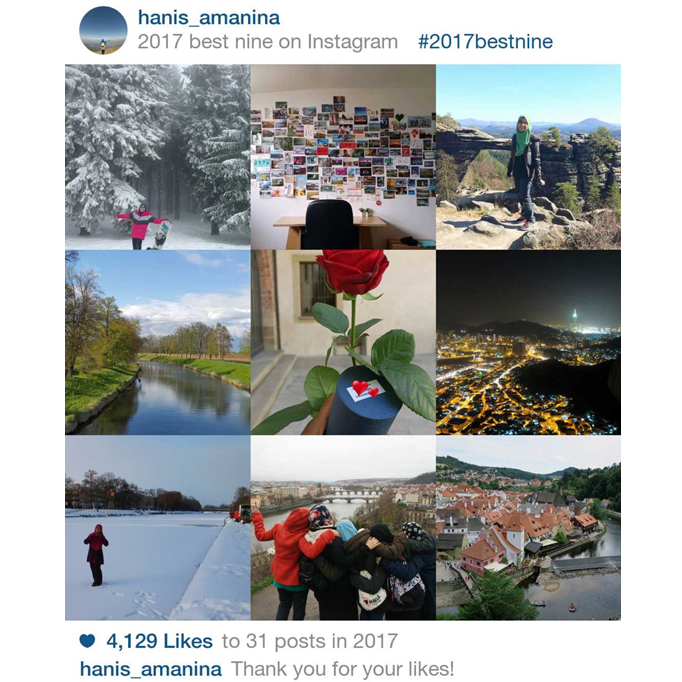 After checking the best nine pictures on Instagram, I realized I already described most of the events behind them in my blog. :D Wahaaa, senang kerja nak recall. My first snowboarding experience ever. Too bad that I tried it only during my final year there. But, never mind, still one of my best memories! Farewell. My wall of memories. ❤ A personal tip for simple souvenirs for ourselves - buy a postcard from any cities that we go, write our feeling at that moment, give words of encouragement to ourselves, record any significant incidents and experiences. In the future, I'm sure we will smile while reminiscing those moments. These postcards will remind us, Allah already blessed us with lots of rezeki and He is definitely capable to give more. 😊 Just keep praying, insyAllah. I love to collect postcards when I was in Czech. Just for now, all postcards are safely stored in my wardrobe. I am not allowed to stick anything on my bedroom wall. Haha. The day I guided a hike for a family of 5. :) There are not much of any other travelers / backpackers I met who requested personally to hike somewhere in Czech. 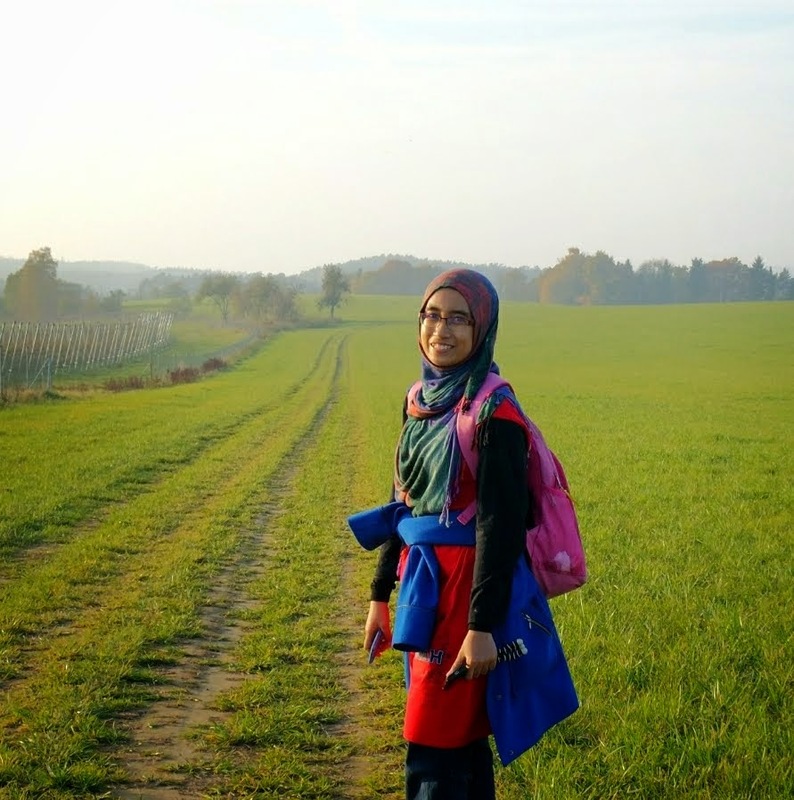 :D But I used to take few Malaysian students from Sweden, Egypt and China to go hiking in Adrspach. My favourite route to run / jog / cycle in Hradec Kralove. :) It is beautiful in any weathers, any seasons as well. On how He leads my heart. Not a fan of buildings but this place is an exception especially when it is hugged by the curly Vltava river. Another beautiful town in Czech. :) It was when I took my parents to Cesky Krumlov. I am glad that I am doing this post. A good feeling to have on the first day of 2018. I received lots of love in 2017, I should not forget and ignore this fact. Alhamdulillah thumma Alhamdulillah! May 2018 be great in its own way! Why Muslims Visit Jabal Rahmah?